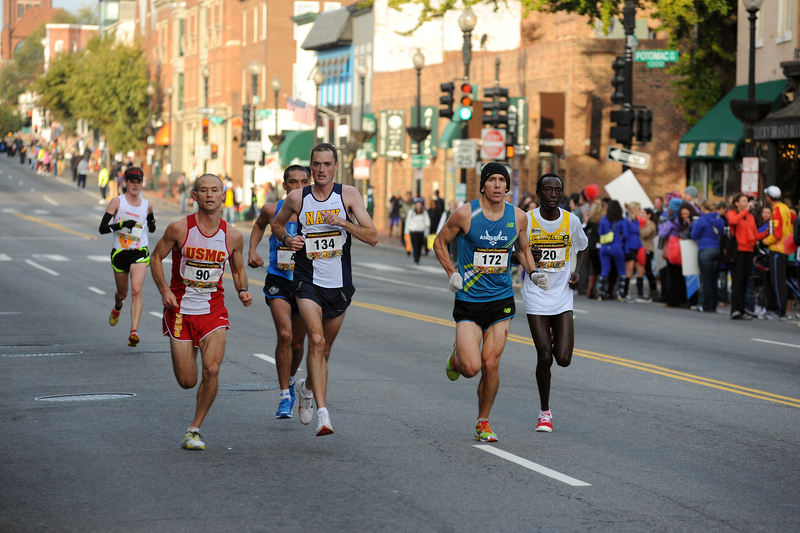 Runners race through the streets of Georgetown during the 2010 Marine Corps Marathon (Marine Corps photo by Lance Cpl. Reagan Lodge). After Action wants to give a shout out to the tens of thousands of runners toeing the line at the 36th Marine Corps Marathon on Sunday. Here’s hoping the months of grueling long-runs pay off with a huge PR. In town and thinking about watching the marathon? Aren’t sure when the gun goes off? Figure you’ll catch a Metro train and see where you end up? Don’t worry if you haven’t done your pre-race homework — event organizers have you covered. The MCM folks have put out a special video guide for spectators with some viewer-friendly locations and race-watching tips. Metro opens at 5 a.m. on race day, with opening ceremonies slated for 7:30 a.m.
Organizers have even made it possible for the couch potato fans to follow the progress of a friend, a spouse or a fellow service member. Make sure both the runner and the fan base have registered for the marathon’s extensive social media network, which will track individual racers via Twitter and Facebook posts, and even send text messages. And if you’re doing the tweeting, add #36thMCM to be a part of the race-long conversation.